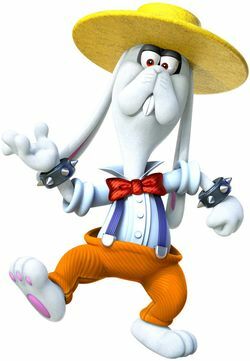 Rango is a tall and lanky member of the Broodals in orange pants, a white button shirt, red bow tie, and indigo suspenders, as well as a yellow hat. He acts as the group's bouncer, and is first fought in the Lake Kingdom in Super Mario Odyssey. Rango attacks by throwing his hat like a boomerang (from which his name is derived), which resembles a Grinder. Mario must throw Cappy at it to flip it over, then bounce on it to land on Rango (who puts his hands on his head), as he is too tall to stomp with a normal jump. 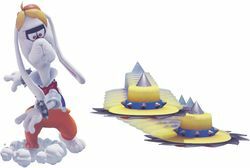 Rango will then partially withdraw into his hat and hop in pursuit of Mario after a while or if Mario stomps on the hat. Mario must then repeat the process three times to defeat Rango. He is fought again in the Snow Kingdom. He says that he has taken the Frost-Frosted Cake and believes it will please Bowser. In this fight, he throws two hats instead of one and the arena is icy. Rango is also found as one of RoboBrood's pilots in Bowser's Kingdom. Rango is encountered for the final time at Dark Side. He expresses his anger at Mario for stopping Bowser's wedding, as no one will hire the Broodals anymore due to their failure. The fight is the same as the previous one, but because of the lighter gravity in the Moon Kingdom, Rango's hops go higher and further than usual, but it also lets Mario jump on him without Cappy. As of June 27, 2018, the player can purchase a costume at the Crazy Cap shop based on Rango. Rango was designed tall enough that the player could enjoy using the "cap" as a trampoline to hit him. When hiding under his hat, Rango greatly resembles both a Spiky Topman and Topmaniac. Based on some of his speech mannerisms (e.g. pronouncing "you're" as "yer") and "hyuk" laugh, he seems to speak with a Southern drawl, similar to Goofy from various Disney media. His droopy ears and jowls also resemble Goofy's. Rango is the only member of the four Broodals whose two story-oriented battles are both optional. ↑ Post about Rango from the official Japanese Super Mario Odyssey Twitter account. This page was last edited on April 24, 2019, at 17:07.